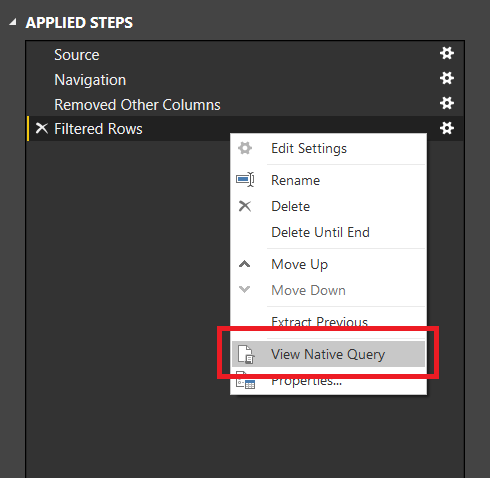 As Devin says, this is very important because it’s the first time that we as developers can check to see whether query folding is taking place within the Power BI Query Editor (I guess this feature will come to Power Query soon, maybe sometime in autumn 2016), and getting query folding working is the key to getting good performance when loading data. 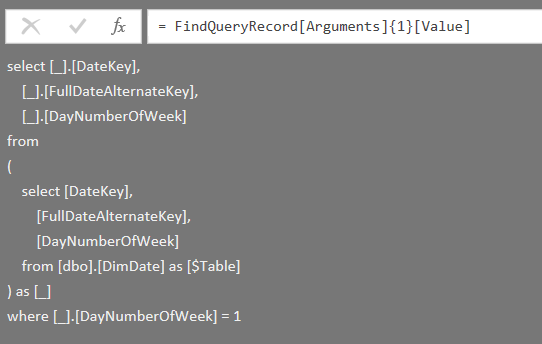 As far as I can see, the Value.ResourceExpression() function can be used with any expression where query folding is taking place and returns a record which, if you dig deep enough into it contains the SQL query. The record itself seems to contain all the information needed to invoke the new Value.NativeQuery() function which I’ve also been looking at recently – but I won’t be blogging about just yet because I’m told it’s not quite finished. Why is it useful to get the SQL query as text, rather than just seeing it? Well… I have some ideas, and hopefully some other upcoming blog posts will make things clearer! « Happy First Birthday Power BI! 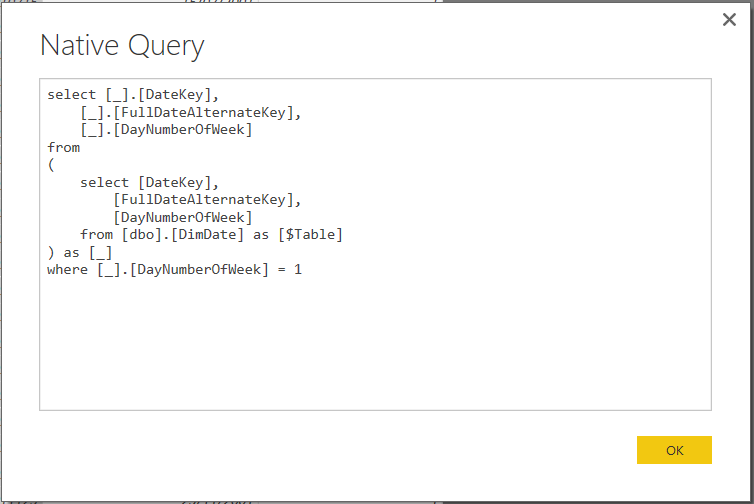 This Power Query version (Version: 2.35.4399.761 64-bit) already has this option, View Native Query. It is interesting that the Sort is not folded? Yes, it is interesting- I’m sure I have seen sorting folding in the past, but things might have changed. It looks like sorting folding can depend on previous step. If I add Sort after Renamed Columns, query is not folded. But anywhere before that step, query is folded. Also note that renaming or not the sorted column has no difference. There are lots of scenarios (though not as many as there used to be) where changing the order of your steps enables more query folding to take place, so this doesn’t surprise me. I worked my way through “M Is for (Data) Monkey: A Guide to the M Language in Excel Power Query” which is great by the way for introduction into power bi. This book states that Query folding cannot be executed against a line that that contains custom M or SQL statement. For a SQL statement I can understand that; but for ANY line of custom M code? I guess in reality then the it’s more a case that “well it depends”? Hmm, it’s not a case of “it depends”, that statement is just incorrect. Whether folding takes place or not has nothing to do with how the code was generated.